Elon Goldfinger masterminding a plan to break into the Fort Knox Lithium depository in Kentucky. Ealier today we reported on a mysterious ‘Project Goldfinger’ we discovered during a tour of Tesla’s Nevada Gigafactory. Everyone including Elon Musk claimed to have no idea what it was, but I’ve got a few ideas. 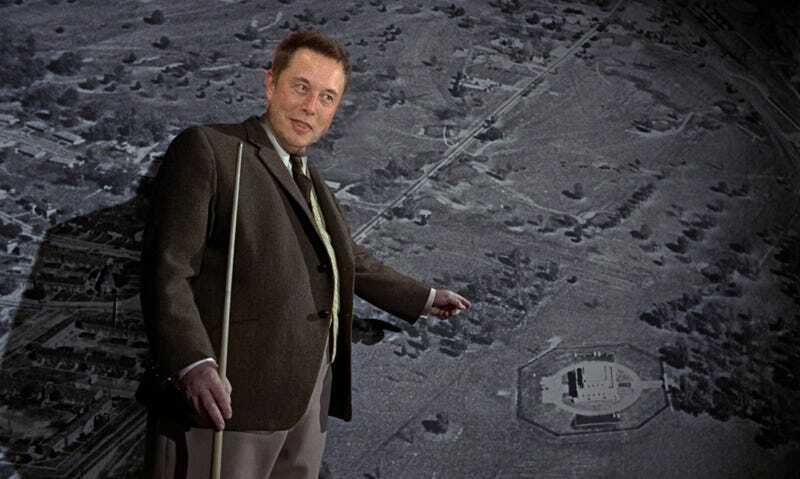 What Is Tesla&apos;s Top Secret &apos;Project Goldfinger&apos;? Of course Goldfinger is the seventh original James Bond novel by Ian Fleming and the third James Bond story adapted to the film franchise in 1964. The film was the most successful and popular movie in the world for awhile, and single-handedly launched both Sean Connery and the Aston Martin DB5 to super-stardom. The novel involved a plot hatched by a supervillain megalomaniac named Auric Goldfinger who was obsessed with gold. The plan in the book was just to steal the gold from Fort Knox and load it on a train. The movie improved on what was a glaring plot hole (how do you get a train-load of American gold out of Kentucky without all of America stopping you) by having our supervillain irradiate the gold in Fort Knox so his personal gold stash would gain more value in the world market. As we said in the original post, Elon Musk shrugged the ‘Project Goldfinger’ sign we saw off as “probably” a joke. That’s what he wants us all to think until we wake up and suddenly all of the Earth’s lithium is missing. Whatever ‘Project Goldfinger’ is, if it’s anything at all, it sounds like it will be the most popular but surprisingly boring plan in a never-ending series of mediocre and repetitive plans that will struggle to stay relevant through changing social and cultural shifts for decades to come. I’m already a fan.